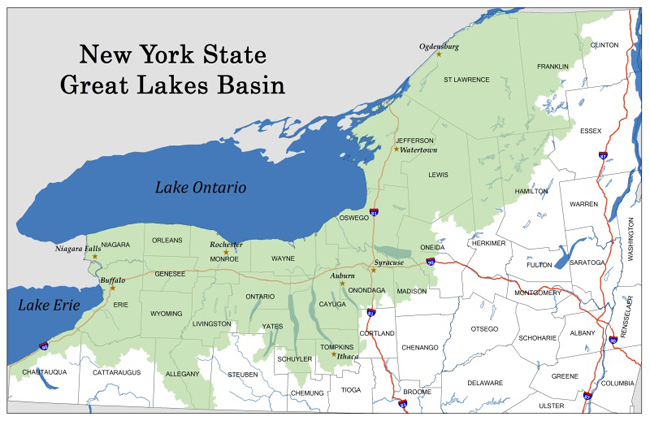 July 12, 2018, Ithaca, NY - New York Sea Grant (NYSG) in partnership with the New York State Department of Environmental Conservation (NYSDEC) created the New York’s Great Lakes Basin Small Grants Program to support stakeholder-driven efforts to restore and revitalize the state’s Great Lakes region and demonstrate successful application of ecosystem-based management (EBM). This program—made possible by the New York State Environmental Protection Fund and Article 14 of Environmental Conservation Law—supports local projects that lead to larger-scale activities described in New York’s Great Lakes Basin Action Agenda (GLAA), a document first published in July 2014 that identifies pressing problems and actions which will benefit from holistic approaches needed to protect natural resources, environmental quality and economic development. It is anticipated that monies for these grants will be made available on an annual basis, depending on funding. Each year, new priorities may be identified, as sub-basin work group meetings identify regional and basin-wide collaborative actions needed. Between 2015 and 2017, some 13 projects amounting to $281,000 in grants were funded. As part of the larger, multi-year partnership that continues through at least 2022, the purpose of these projects is to help Great Lakes coastal communities enhance their resiliency to events like severe storms and protect water quality. Below are summaries of the first few rounds of these projects. More on these and other projects in this group, and the small grants effort at large, can be found, respectively, via the July 2018 NYSG news item, "Stream-Road Crossing Markers: In Recognition of Great Lakes Small Grants Projects" and at www.nyseagrant.org/glsmallgrants. 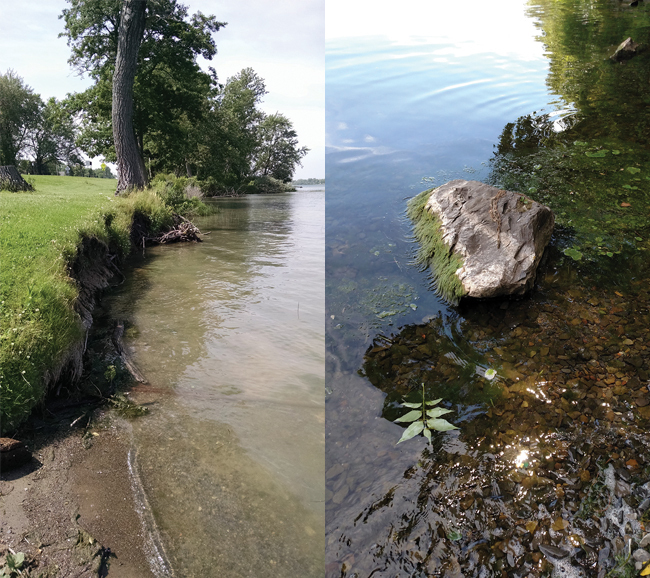 (At left) Shoreline and riverbank failure, Summer 2015. Credit: Buffalo Niagara Riverkeeper; (At right) Rock on north shoreline of Seneca Lake, July 11, 2016. Credit: Lisa Cleckner. Eleven proposals were submitted in response to the Request for Proposals (RFP). Of these projects, four were selected for funding beginning in 2015. 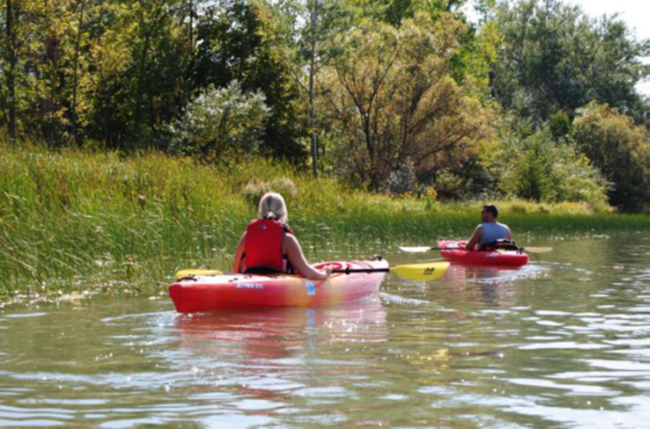 Emily Sadowski and Joseph Gould kayak along the West River, along Grand Island, in order to gather field data. Credit: Joel Bernosky. The 11-mile protected shoreline on the Niagara River along Grand Island, near Buffalo, New York, is undergoing degradation, due to natural and human-made factors. Stakeholders conducted outreach with local residents about preserving this special habitat. Allowing grasses, trees, and shrubs to grow along the shore could be part of the solution. Through this project, Buffalo Niagara Riverkeeper completed targeted outreach to community members and municipal officials in order to provide technical assistance and tools needed to improve shoreline health and coastal resiliency. Project work also involved efforts to advance a living shoreline demonstration project at a site experiencing erosion along the West River. This project enhanced the resiliency of a coastal community in response to shoreline change affecting the North Pond Inlet, near Oswego, New York, and the coastal barrier between Lake Ontario and North Pond. Potential topographic volumetric change based on LiDAR (Light Imaging, Detection and Ranging) data and prior topographic mapping data. Shoreline dynamics were then characterized with an assessment of the extent of sand mobilization and identification of areas of significant progressive change. Findings and recommendations applicable to ecosystem-based policies and inlet management planning were developed. Mapping the North Pond Inlet was done by airplane and geographic information systems. One surprising environmental consideration for dredging and other inlet management operations is the first nesting of piping plovers in the vicinity of the inlet in over 30 years. For more, see the June 2017 article in the Watertown Daily Times, "Aerial photos help researchers assess changes along Lake Ontario shoreline, North Sandy Pond." In the last four years the increase in high flow weather events, extreme wave action, and increased iced cover on shallow sandbar areas in the Village of Sodus Point has caused roughly 5-7 feet of bank erosion along five hundred feet of unprotected coastline with the rate of erosion of 1-2 feet per year. A sewer main that supports a third of the residents of the Village and four major trees in close proximity to utility lines were within approximately 15 feet of the eroded bank. A roadway to a public beach was about 20 feet from the eroded bank. Using an ecosystem-based management approach, the Wayne County Soil and Water Conservation District implemented shoreline protection encompassing various textiles, riprap, and natural vegetation to provide deep root control of the shoreline. This will reduce vulnerability to flooding, drought, and other extreme weather events, mitigating potential sewer and infrastructure compromises. This project marked a success for the sustainability of the wastewater infrastructure that runs along the lake. In total, some 500 feet of shoreline was protected from the constant changes of weather patterns in the Village of Sodus Point. Among the Great Lakes, Lake Erie is the fourth largest in surface area and the smallest in volume. Because of its shallow depth, Lake Erie demonstrates a unique free water level fluctuations pattern known as seiches, triggered by passing storms. The stronger the storms, the more pronounced seiching oscillations become, raising the water levels along the affected shore. The seiche itself, therefore, can be a source of unexpected flooding and aggravate erosion in Lake Erie's low-lying coastal areas. Investigators of this project evaluated the contribution of seiche and seiche-induced flooding and coastal erosion in New York State’s Lake Erie coastal areas through numerical modeling efforts. The results of this study can potentially be generalized to the rest of the Lake Erie shoreline in other states. Farhadzadeh, A. (2017). “A study of Lake Erie seiche and low frequency water level fluctuations in the presence of surface ice”, Ocean Engineering: Vol 135, 1 May 2017, Pages 117–136. Farhadzadeh A., Hashemi M. R., Neill S., “Characterizing the Great Lakes hydrokinetic renewable energy resource: Lake Erie wave, surge and seiche characteristics”, Energy: Vol 128, 1 June 2017, Pages 661–675. Farhadzadeh, A., Ghazian Arabi, M. and Bokuniewicz, H. (2018). “Contribution Of Seiche In Storm-Induced Beach Profile Evolution In Eastern Lake Erie”, Shore and Beach: 86 (2) May 2018, Pages 19-26. Nineteen proposals were submitted in response to the RFP. Of these projects, nine were selected for funding beginning in 2016. Members from the Onondaga Earth Corps and volunteers from the Onondaga Nation Youth Group (above, center) work to plant trees at the Tully Farms restoration location. Credit: Amy Samuels/Onondaga Environmental Institute. The City of Rochester and Monroe County are increasingly using green infrastructure technology for public stormwater management redevelopment projects in their respective jurisdictions. Similarly, there is an emerging interest from the private sector and surrounding communities in the use of green infrastructure for stormwater management. As this trend gains momentum, it is important to proactively develop best management practices to guide the planning, design, implementation and maintenance of green infrastructure installations. Unfortunately, prior to this effort, this did not currently exist. From this project a Green Infrastructure Design and Maintenance Manual was developed to encourage and guide the proper use and installation of green infrastructure technologies with an emphasis on retrofit and redevelopment projects. In recent years, severe storms have caused a portion of the Port Bay Barrier Bar near Lyons (in New York's Wayne County) to succumb to erosion. While high water levels and erosion have been a concern for some years, a breach in the bar brings serious economic and ecological problems. Port Bay is connected to Lake Ontario by a small outlet through a barrier bar, which is important for pleasure boaters, aquatic spawning, anglers, safe refuge and emergency response vessels. The barrier bar provides a buffer between Lake Ontario and Port Bay, but wind and high water have reduced the bar to a fragile narrow barrier that is often breached by the wave action of Lake Ontario. Funds for this project helped to assess, research, and complete geographical, fisheries, and wildlife surveys to aid in the establishment of an action plan to restore Port Bay’s East Barrier Bar, and to assess the route of engineering needs to implement this restoration project. Efforts of this study have since accelerated planning and design for a natural shoreline restoration demonstration. The need for conservation and protection is especially acute in Great Lake watersheds. These watersheds are part of the largest surface freshwater system in the world – a system that provides drinking water, recreation, irrigation, and transportation for tens of millions of people. Yet in areas such as New York’s Great Lakes basin, over-development, coastal flooding, polluted runoff, and erosion are taking a toll. Through education and inspiration, CurrentCast has educated listeners about these issues and engaged them in solutions. In 2016, 20 sixty-second CurrentCast segments were produced and distributed on topics including invasive species, stormwater management, shoreline protection, riparian restoration, flooding and erosion prevention, wetlands protection, and green infrastructure in New York’s Great Lakes basin. Partners on this project include: The Center for Transformative Action at Cornell University, the Atkinson Center for a Sustainable Future at Cornell University and the New York State Department of Environmental Conservation. For more, see NYSG's related press release on and listen to podcasts in this series on this effort. With the passage of the National Flood Insurance Act in 1968, the focus of disaster mitigation turned from flood control projects to nonstructural techniques such as land-use planning. The Community Rating System (CRS) program, which is a voluntary incentive-based program, rewards municipalities for exceeding the National Flood Insurance Program’s (NFIP) minimum standards, and uses nonstructural or “soft” mitigation measures to promote community resiliency and ecosystem integrity. Outreach and education about steps communities could take, collectively, to reduce the risk of floods to insurable property were provided via this demonstration project to three communities in Wayne County. These efforts in turn help to strengthen and support the insurance aspects of the NFIP while also fostering comprehensive floodplain management. These steps can lead to the restoration of coastal wetlands, beaches, and dunes. In addition, coastal infrastructure can be improved. A discount up to 45% is available to policyholders in participating communities. This study proved to be a timely one, as water reached disturbingly high levels in Lake Ontario in 2017 (those events were addressed in a separate, NYSG-funded project, the results of which can be found at www.nyseagrant.org/waterlevel2017. 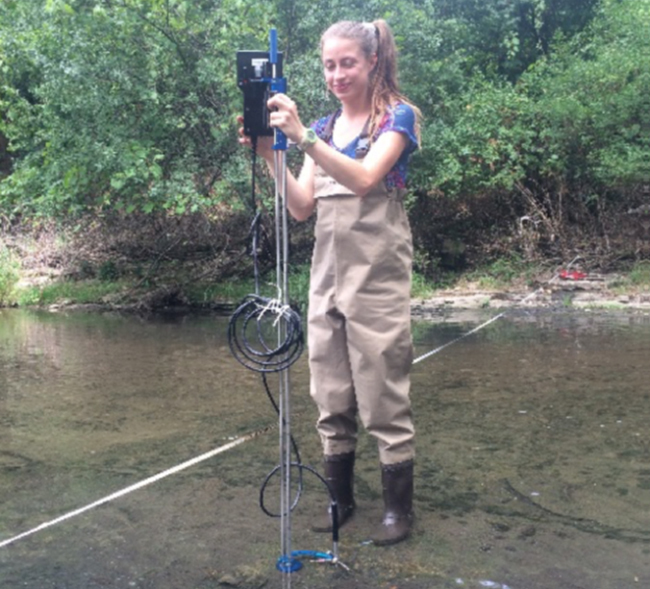 Meagan Hopkins at Scajaquada Creek taking stream discharge measurements. Credit: Christopher S. Lowry. With increased incidence of heavy rains, there will be heavier water discharge into Lake Erie. An increase in discharge will lead to a persistent high level of nitrate loading, which can result in harmful algal blooms (HABs), especially in warmer climate scenarios. To protect human and aquatic ecosystem health, knowledge of both the timing and source of nutrient fluxes are needed. At present, little is known about nutrient fluxes from Western New York (WNY) tributaries, particularly during winter and spring. This project will increase our understanding of how these nutrients affect the health of our waterways, providing a first critical step towards building a more comprehensive pollutant flux network for the Lower Great Lakes centered in WNY. Restrictive water level regulation in the St. Lawrence River over the past 50 years has had a profound impact on ecosystem health in both the river and its headwater, Lake Ontario. There is a critical need for sound scientific information to support policy decisions on changing water levels in this area. Such information is difficult to acquire in systems as large and seasonally hostile as the Great Lakes and their connecting channels. In addition to developing a bi-national water quality monitoring system and supporting adaptive management efforts for the St. Lawrence River between the U.S. and Canada, investigators visited three sensors at two testing sites every one to two weeks. These investigator collected cost-effective year-round high resolution water quality data from sensors housed in power dams on the St. Lawrence River. These data have been used to establish linkages between water quality and water quantity (levels), a core element of an effective adaptive management strategy for water level regulation, and to communicate this information directly to the agencies and institutions responsible for adaptive management of lake levels. Onondaga Creek, April 2016. Credit: OEI. Onondaga Creek is a major tributary to Onondaga Lake, and is part of the greater Lake Ontario watershed. In recent decades, the exotic brown trout (Salmo trutta) have become the predominant ‘cold water’ species in the creek, due to its comparatively high tolerance to environmental perturbations, ability to out-compete native trout populations, and success and popularity of brown trout stocking programs. Recent research has shown water chemistry and canopy to be major drivers of fish community structure in Onondaga Creek, with many areas in the watershed lacking adequate riparian vegetation and habitat heterogeneity to adequately support coldwater species. 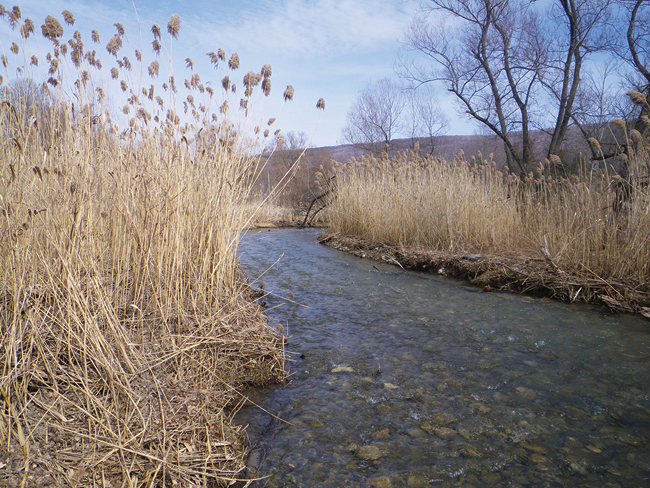 Investigators for this project sought to enhance the resiliency, water quality and aquatic habitat value of Onondaga Creek by increasing riparian buffers, improving bank stability, and removing the invasive Phragmites, common reed. Collecting water samples, Winter 2016. Credit: Chris Lowry. The fouling of beaches by decaying benthic algae is one of the most important nearshore water quality issues in the Great Lakes region, with a direct effect on coastline health. Cayuga Lake in the Finger Lakes Region of New York is a particular problem when it comes to plants, floating debris and rotting vegetation. In the Finger Lakes of the Lake Ontario basin, residents have recently reported the presence of benthic algae and Cladophora in nearshore areas resulting in beach fouling, odors, and interference with recreational activities including swimming and boating. 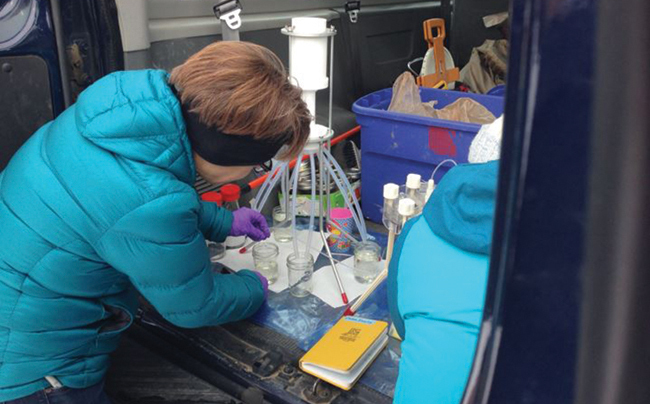 A water quality monitoring program was developed through this study that works with citizen scientists to determine levels and sources of nutrients and bacteria in the nearshore area of Cayuga Lake. This information will then inform a remediation project, targeting either wastewater treatment plants, septic systems, or non-point pollution sources such as agricultural runoff. Investigators measured algae growth, as well as nearshore temperature and water clarity in the lake. In addition to assessing nutrient inputs, and educating the public about harmful and nuisance algae, investigators are proposing remediation solutions. Owasco Lake stretches 10.7 miles from north to south, and is the primary drinking water source for over 44,000 residents in central Cayuga County, including the City of Auburn and the Town of Owasco. Stakeholders and agencies working throughout the watershed have identified specific challenges that negatively impact water quality, threaten the water supply, and impair public bathing and recreation activities. Stressors in both Owasco Lake and its tributaries include elevated levels of sediment, excessive nutrients, and public misunderstanding regarding water quality issues. The target for this TAIPP project was to develop the Tributary Adoption and Identification Pilot Program resulting in simple, public-friendly information management tools focused on enhancing local public awareness, involvement, and understanding of watershed issues and concerns. For more, see the October 2016 article in the Auburn Citizen, "Owasco Lake watershed inspectors hope new signs will keep streams clean."